Hello 2018! New year, new content. It has been a bit quiet lately on my channel, but I was working on something amazing. By today I’m launching the Content Creator Storage Guide. With this i want to give creative people the ability to be a creative rather than wasting their time on browsing through tech specs. Finding a suitable Storage device for your needs can be hard at times. Most of us need a reliable Workhorse when we are on the go and also a fast solid archive for work back in the office. For this various workloads you’ll need different kind of devices. A fast device not necessarily equals a safe one and the other way around. Also a RAID does not replace a Backup. So with all the said, let’s get to it. 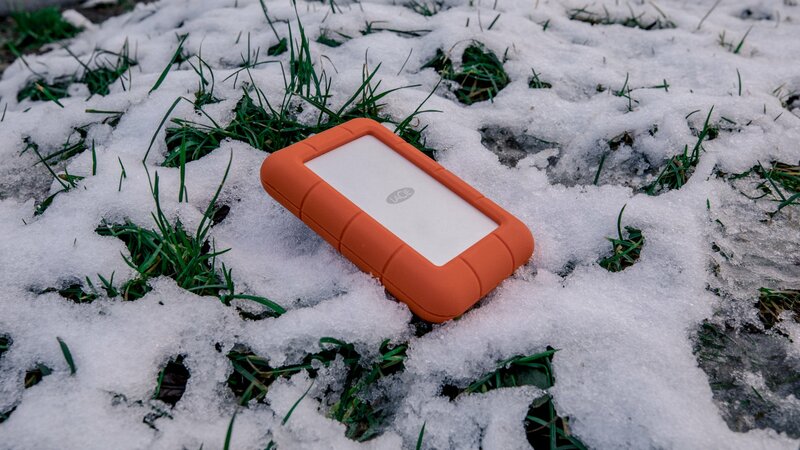 We’ll kick off the Content Creator Storage Guide with the Lacie 4TB USB-C Rugged External Hard Drive. It will serve as a Baseline for the upcoming Reviews. At the end of every Review I’ll give you specific Score for every product. 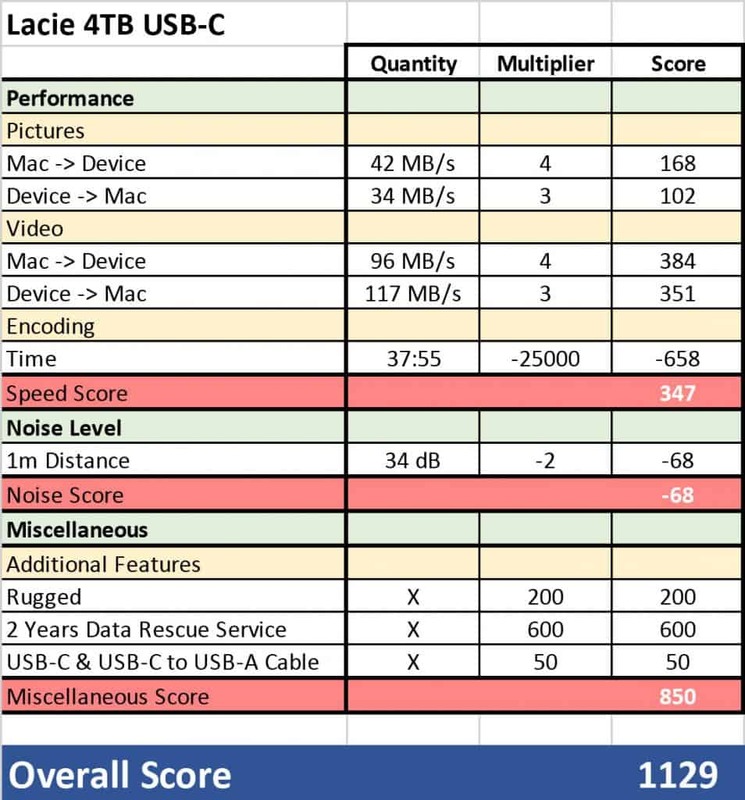 The Score is based on a mix of values from different criteria. The Multipliers are based on what I think is helping a creative Content Creator the most . Through this matrix you’ll be able to compare every Product I’m reviewing in the future. And of course you can adjust the Matrix to your liking if you want to. If you would like me to incorporate additional test in my reviews, hit me up and maybe I’ll will include them in my next episodes. 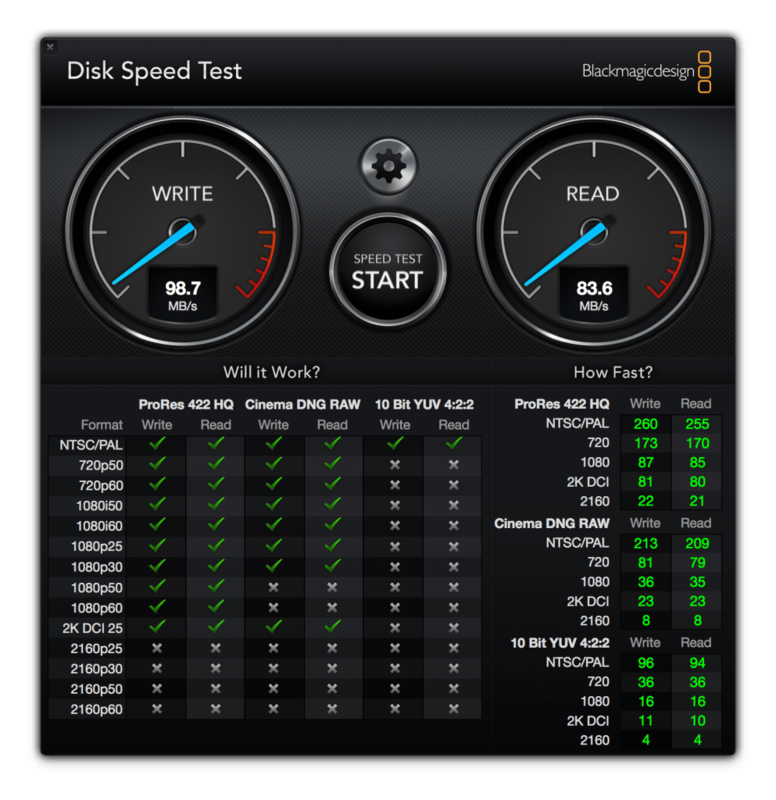 A lot of people tend to benchmark Storage Devices with Blackmagic Disk Speed Test. Don’t get me wrong it’s a great Test, but it’ll only tell you whether your device is fast enough to play back a videostream in a certain Resolution/Bitrate. It’s not telling you how your device will perform for exemple with a huge Lightroom Database or when you copy huge amount of Data after a job. This is where Amorphous Disk Mark comes in. It not only tests sequential read and write procedures, it also test random read/writes. It also puts a lot of heat on your device with its 4K Benchmark. This value gives you a better impression how Devices perform with small files. These values are all very techy, so i also wanted to supply you with something more relatable that you face on a daily basis. To achieve that, I conducted two tests with a huge amount of date. I transfered one folder of photos with 20.850 items with 32GBs and another one with 41 videos that allocate 121GBs. Last but not least I also measured the time it took me to render a 13 minute 4K video. Enough talk about the Storage Guide, let’s talk numbers. The Lacie 4TB USB-C Drive is one of the best companions you can wish for when it comes to “on the run” Drives. It’s moving parts will not be damaged the first time you drop it thanks to it’s silicon bumper. Lacie also offers a very unique Service with all their professional Products. If those Drives or Devices fail you they offer you Data Recovery Services. Even if you accidently delete some important files. For the Lacie 4TB USB-C Drive you automatically receive 2 years of this service with your purchase. Since the drive is optimised for Media Content Creators, it performs very well with huge amounts and large files. You even can edit directly on it. Sure Encoding could be faster, but for a drive this size that is rugged it’ll be hard to find something better. 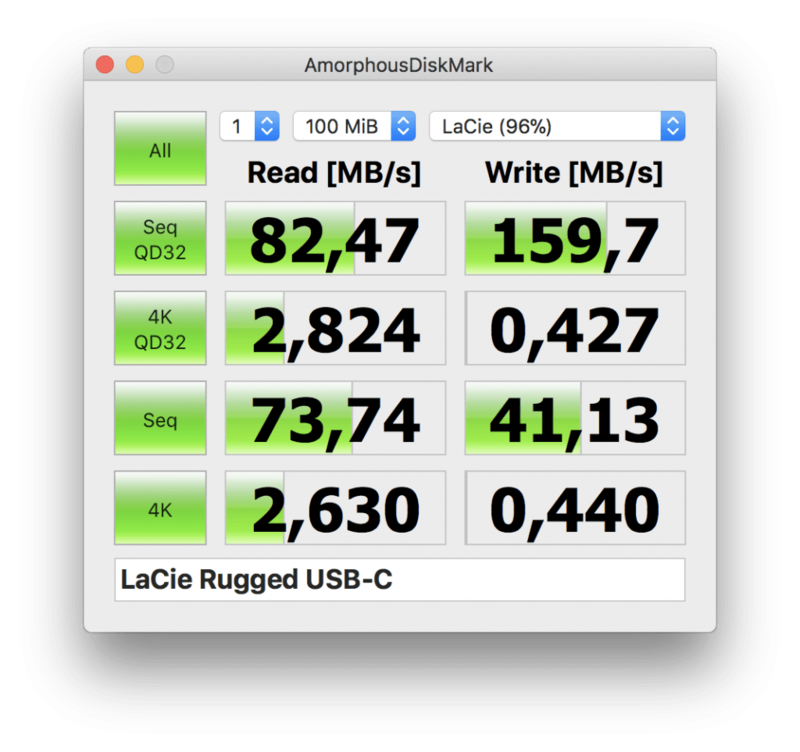 Overall the Lacie Drive in my opinion is a really decent drive for the money you hand over the table. So i would entrust it with my footage every single time I travel. Nevertheless you always should Backup your Files. Even the Best Drive can fail you in the worst possible situation. With that said, next time we’ll take a look at Drobo’s 5D3. If you liked my Review I encourage you to check out my affiliate links to support me with upcoming reviews. Happy browsing,vdon’t forget to Subscribe to Channel and I’m looking forward to see you nex time. Next: Next post: Mavic Air vs Mavic Pro Comparison – Which is the right one for you?